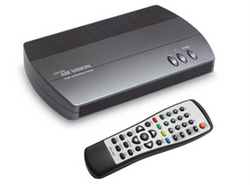 Grand Air Vision is an ATSC receiver box which receives HDTV and SDTV terrestrial broadcasts and displays them on any TV or HDTV with automatic format conversion. It tunes and decodes all 18 approved ATSC digital television formats. It has 480i, 480p, 720p, and 1080i selectable outputs to match to your television's optimum viewing capability. It can be configured to output for either widescreen 16:9 or standard 4:3 televisions, choosing from letterbox, zoom, and full-screen outputs. An easy-to-use electronic program guide, or "EPG" displays TV programming information while full "V-Chip" parental controls let you restrict mature programming from ATSC sources. It also features component and composite for video signals.